I’m in Old Oakland at the Farmers Market. Several fruit stands already have cherries — quite to my surprise at this time of year. It’s always fun to stroll through this lively atmosphere. I take a small detour from the market, to find some lunch, and stop at a place that advertises Cajun and Southern food. I’m not one for spicy food, but I find an item on the menu posted in the window, that looks very appetizing: “Shrimp & Grits”. My friend Patrick once told me that this is a Southern specialty, and I have always been curious to taste it. Although it is a bit windy, I decide on the lone outside table, after glancing over at a very loud TV inside the restaurant. The proprietor seems a bit grouchy, but I opt to stay anyway, and order the specialty. Asking for some water, I am pointed to a cooler that has water bottles in it. Interestingly enough, they are old milk bottles with re-closable tops from Normandy that now serve as water bottles. Its fun to decipher the old label with my rudimentary French. I’m guessing the bottles from this family farm are at least 50 years old. The chef/proprietor brings me my bowl — it seems this is a one-man operation. I ask him for some napkins and am asked: “You gonna spill it”? Must take me for a messy eater. He goes inside and reappears with a batch of napkins, most of which I return unused later on. A sign on the sidewalk advertises that this establishment was voted “Best of” by a magazine in 2012. Let’s see, I’m guessing perhaps for the food, most likely not for the hospitality. The food is indeed very good: shrimp and grits, with bacon bits, green onions, surrounded by gravy. I had paid a visit to a street vendor before lunch contemplating a purchase, and now return after my “Shrimp & Grits”, getting some change by buying a bag of fresh almonds from a nut seller. As the item from the street vendor in question will be a present for one of my sons — who I think read this blog once in a while — I have to keep it a secret as to what it is. A hint: it is of a culinary nature, as I taught both of them to cook. The vendor jokes with me, that the item in question is free, but that I have to pay for the plastic bag. The most expensive plastic bag I have ever seen! I pet his friendly dog, as we complete our transaction. At the other end of the market, I buy some blue cornflowers — summer is on its way — they whisper. 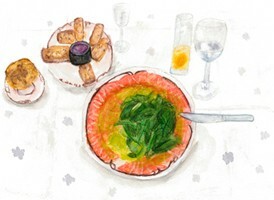 Thank you for our daily bread, in the form of “Shrimp & Grits” today. This entry was posted in Blog Posts and tagged bacon, bottles, cherries, corn flowers, daily bread, gravy, green onions, Normandy, shrimp & grits, water on May 12, 2013 by matthiasleue. Doing my feeding duty to stock up on cat food for my “Haustier” (translated from German that means house, or domestic animal), and replenishing a bag of bird seed as well, I wandered into an unknown aisle on my way to the pet supply store cashier, and came upon “Lizard Litter” — prompting a loud laugh at the sight. What will they think of next? I have been the reluctant recipient of various sections of lizard in the summertime before, proudly brought home by my cat Calvin — for which I praised him of course, as it was a present — but then disposed of right away, sometimes helping a tailless, but happy and relieved lizard regain his outdoor status. To keep them as “pets” seems against nature to me, but to actually sell lizard litter — absurd. What’s next, toilet paper and air freshener? I can’t make heads or tails of this matter. A recent wave of warm weather, has caused the elms in my neighbors’ yard to sprout fresh green leaves, while at the same time dropping their blossoms. When a sudden wind gust comes up, it looks like it is snowing, as the little petals dance and drift through the air. Many red flowers are blooming now, and this has attracted quite a few hummingbirds — my favorite birds. Sometimes they fight and chase each other at breathtaking speeds, all the while chirping at the top of their voice. God’s most delicate bird. One erred into my loft just last week, but got out by himself. I have had to help a few baby hummingbirds over the years, who would fly against the window, unable to find their way out. It is a miracle to hold something so soft and delicate in your hands. 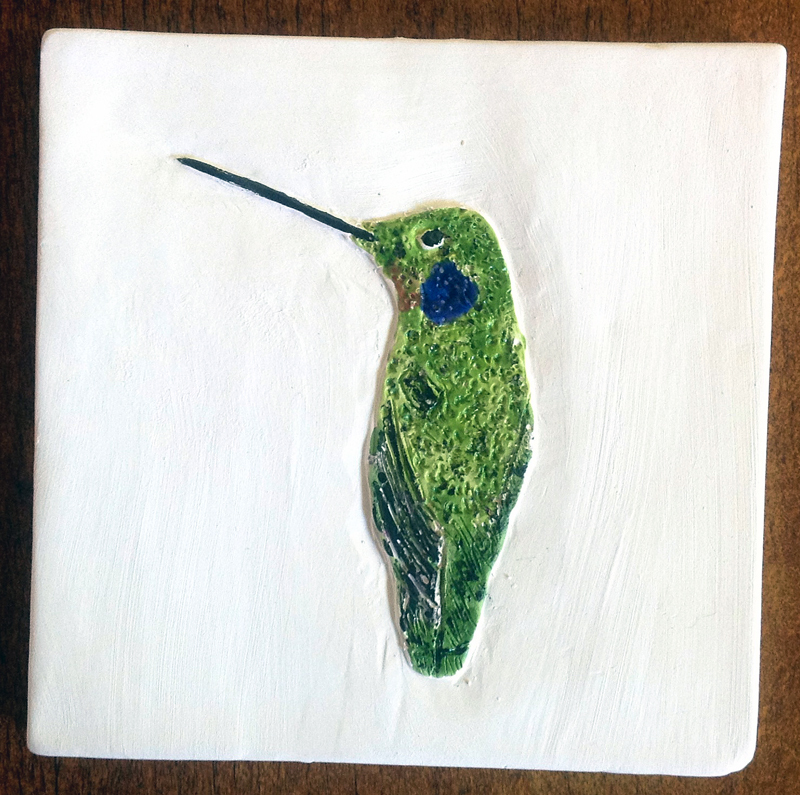 The hummingbird you see here, I carved and painted on a ceramic tile. May red flowers and hummingbirds brighten your week, and don’t step in any lizard litter. This entry was posted in Blog Posts and tagged blossoms, Calvin, cat, ceramic tile, ceramics, elms, flowers, Haustier, hummingbird, leaves, litter, lizard, pet store, red on May 5, 2013 by matthiasleue.